The Shakespeare Agility 2 Bass is designed to give bass anglers maximum feeling and detection for bites and has a light weight blank for long holding comfort. The Bass rod is designed with super slim, carbon fibre blanks for strength and a light weight which will help to give better bite indication. The fast taper and power flow will give you a quicker indication of bites that are developing so you can react quicker to achieve a higher hook up ratio. The rod is beautifully designed, with new stunning metallic blue coloured blanks and silver details. The EVA split handle provides comfort and secure grip and there is tough, smooth Zirconium Oxide guides fitted throughout. The rod is rated 2-4oz making it perfect for estuary, surf and rough ground bass applications. 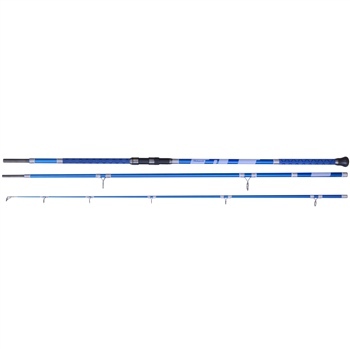 The Shakespeare Agility 2 Bass is 11ft6 in length and has a 3 piece equal length design.